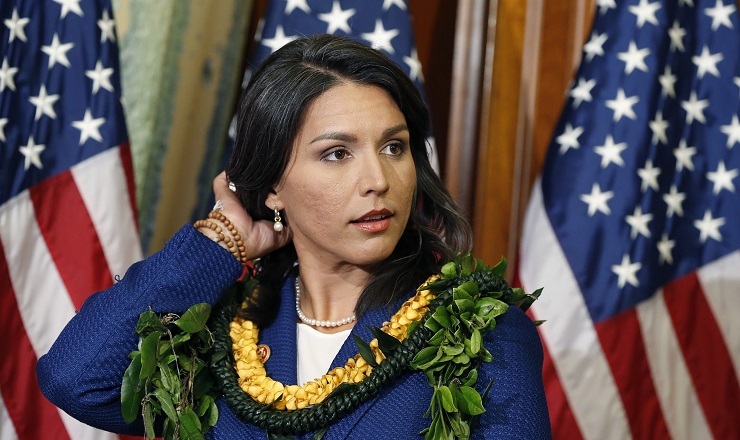 Born in American Samoa, Representative (Major) Tulsi Gabbard of Hawaii, a Democrat and, far more than Trump, someone who stands against hypocrisy and fakery of every kind, is now running for President of the United States. Unlike Trump or Clinton or Obama or Romney or so many, Tulsi is military, a decorated combat veteran. Gabbard continues to serve as a Major in the Army National Guard after two combat tours in Iraq, one in 2004 as enlisted and a second as a platoon commander in 2009. All discussion or reporting of this bill and how it was shelved and why, is censored in the US. Why would the Republican Party want to kill a bill prohibiting the US from aiding terrorist groups it claims to be at war with is telling. What is simple here is this, this is a confession that the United States isn’t simply arming and supporting ISIS and al Qaeda but has been all along. Did America found al Qaeda? Has it always been American controlled, including before, during and most certainly after 9/11? A “yes” answer to all of the above is supportable as no evidence to the contrary has ever been substantiated and, of course, no salient questions have ever been asked. Not asking questions and staging fake investigations is what Republicans in congress, every single one financed by gambling boss and Israeli “kingpin” Sheldon Adelson, does best. In fact, it is all they do. As an analog, perhaps John Kerry comes to mind, a democratic candidate in 2004 who was crushed by rampant “Russian free” election rigging involving vote counts, poll interference, laundered voter registration lists, the world was turned on end to keep anti-war Kerry out of the oval office. Tulsi and John have something else in common, both have met with Syrian President Assad. Insiders know the Kerry family and the Assads are good friends. When Assad was accused by the now discredited White Helmets of gassing his own people, then Secretary of State Kerry was quick to tell President Obama that the accusation wasn’t just false but absurd. Tulsi Gabbard, who met with President Trump, passing on what she learned after meeting with President Assad, wasn’t taken seriously. Trump, now clearly in the pocket of Kosher Nostra gangsters, has not just repeatedly attacked Syria openly but Trump’s military has staged “accidents” that have killed thousands of Syrian civilians as well. Even today, with Israel’s attacks on Syria commonplace, military sources tell us that these attacks are, in fact, US backed and part of that very strange narrative where “Russian controlled” Donald Trump is continually aiding Israel against Russia. In fact, Trump also has worked hard, but very unsuccessfully, to turn Turkey against Russia and has pushed for Ukrainian attacks on Russia as well including staging naval confrontations in the Black Sea, and, mind you, this is a “Russian controlled” president. Ah, but we digress, the real subject is Tulsi Gabbard and what her candidacy means. To get real background, we head back to the heady days of the late 1960s. We had a breakthrough presidential race in 1968 with madman Richard Nixon, one of histories’ most hated figures long before Watergate, entering a presidential race where Vice President Hubert Humphrey and former Attorney General and now US Senator, Robert Kennedy vied for the presidency. Breaking up what had previously been a Democratic Party stranglehold on the Southern States was a “darkhorse” candidate, Alabama governor George Wallace, an enigmatic figure, reputed racists but more a “state’s rights” or libertarian than anything else. Kennedy, above all else, ran on an anti-war platform and was, thusly, murdered in one of the poorest staged CIA/Deep State murders in history, blamed on patsy Sirhan Sirhan. For Gabbard it hasn’t gotten down to killing, not yet. The attacks began within minutes of her announcing candidacy, accusing her of working for Russia and Syria, of treason, of “collusion and, above all, accusing her of betraying Israel, which if one reads between the lines, really means failing to buckle under to the Kosher Nostra and the Deep State. “In 2004, Tulsi enlisted in the Hawaii National Guard to serve her state and her country. The next year her unit was deployed to Iraq. Her attendance was not obligatory, but nevertheless, she left her job as a State Representative to go with her unit, making her the first state official to leave their post to serve overseas. During her first 12-month tour in Iraq, she was a part of the 29th Support Battalion Medical Company and earned the Meritorious Service Medal for her performance. Upon returning to the States in 2006, Tulsi began working as an aide for U.S. Senator Daniel K. Akaka. She advised Sen. Akaka on issues such as energy independence, homeland security, the environment, and veteran’s issues. During this time, she also attended the Accelerated Officer Candidate School at the Alabama Military Academy where she became the first woman in the school’s 50-year history to graduate with the highest distinguished honor in her class. In 2009, Tulsi graduated from Hawaii Pacific University with a B.S. in Business Administration. Now a college graduate and an officer in the Hawaii Army National Guard, Tulsi volunteered for a 2nd deployment in Iraq. The author is also a decorated combat veteran, this time a Marine who served in Vietnam at the height of the Vietnam War. After returning to the US, I joined the Vietnam Veterans Against the War and Vets for Peace. I participated in anti-war demonstrations and spoke to public groups in opposition to America’s policies in Vietnam. In fact, I don’t think I ever met a “pro-war” combat veteran of Vietnam, not until decades later and the majority of those turned out to be lying about their military service. Most “flag waving” Vietnam veterans had, in fact, never served in the military at all, a national disgrace. The Tulsi Gabbard candidacy will prove out these dark warnings all too well.